When I was in elementary school my mom made the decision to go back to school and get her master's degree. As a mother of six you can imagine this was a life-altering decision for our family, but she knew that it was right for her. So, she would stay at home all day while my dad worked as a teacher and then they would have a change of the guard and she would head out the door to class and he would take over the evening Mr. Mom shift. My dad had always been involved, but it is fair to say that cooking was just what Mom did and what Mom liked doing. It was her kitchen and while he helped in there, it was her territory. Just about every evening my dad would call my mom's mother. His own mother was not much of a cook and didn't offer much help in this realm, so Grandma Eva was his go-to-chef. Sometimes it was a quick question and temperature or time in the oven and sometimes it was step by step instructions. Slowly Dad learned to cook, one dinner at a time, and eventually the time came that he stopped calling Grandma so regularly. One day my grandma approached my mom and asked, "Did Ross stop cooking?" My mom told her no and asked why and she responded, "Oh, he stopped calling me for recipes and directions so I figured he had quit cooking." How blessed I was to have, not only an awesome mom and dad, but an amazing grandma that would step up and teach my dad! That story became a classic in our family as did dozens of recipes and tips that were shared on those phone calls. What a treasure! Your family favorites may have come from your favorite grandma, your silly dad, or even your own creative brain, but family favorites are those wonderful meals that keep finding their way back to the table. They are the meals and treats that all the kids love to ask for and you love to share. In our family, they are usually back-to-basics, perhaps not the healthiest meals ever made, but dishes that were made with love and shared over a table with our loved ones over and over. Whatever your "family favorites" you need to write them down! I called my grandma for a Banana Cream Pie recipe once and her directions include a lot of little-of-this and little-of-that kinds of things. To the beginner cook that I was (I was in college at the time) that was just terrifying and I didn't even attempt to make the pie after all. Now that Grandma is gone I can't express how much I wish I could make her Banana Cream Pie. Take the time to write down or type up your recipes so they can be shared and the joy you bring to your table can be shared in kitchens of those you love for years to come. 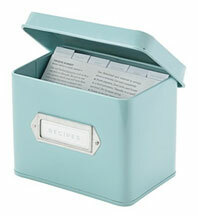 Cook'n offers an easy way to create your own family cookbook. If you don't go that route, at very least jot them down so they can be shared. Your family favorites are treasures and they should be preserved and shared! I hope you will enjoy these favorites from my family! Bake at 350° for 45-50 minutes. Makes 2 loaves. Bring sugar & syrup to a hard boil. Add 1 cube butter at a time. Stir constantly! Add milk and cream alternately. Boil to 230 degrees. Add vanilla. Place cubed bread in bottom of a buttered 8x12 inch baking dish. Top with cheese. Brown sausage, drain, then place on cheese. Beat eggs with milk and mustard; pour over. Refrigerate overnight. Next day, dilute mushroom soup with 1/2 cup milk and pour over. Bake at 300 degrees about 1 1/2 hours.